An understanding of Temple and Tabernacle is most worthwhile. Ezekiel was given plans for a Temple that has never been built - yet. Perhaps the best place to start is by reading 1 Chronicles chapter 22 and 2 Chronicles chapters 1-8. Note in 1 Chronicles 22 v7, 8 and 10, references to the house being for YHVH's name - remembering that Name=Nature. The suggestion is not that God needs a house to live in; it is a place for his glory to dwell near mankind. In 2 Chronicles 2 v5/6 we see Solomon (Shlomo) pondering why the house is to be built. Chapter 3 shows the link to the Threshing floor of Ornan that David purchased and further back to Mount Moriah. The end of chapter 5 and the beginning of chapter 7 speak about the glory of God. Ezra, concerned with rebuilding the Temple, recounts the decree of the gentile king that the Temple should be rebuilt. This gentile could perceive the benefit to the world of having the Jews in Jerusalem ministering to God for all the nations. (Remember Genesis 26 v4). If only today's rulers could see this! Ezekiel had visions of a Temple yet to be built (Chapter 40-42) and the ministry and the Glory of the God of Israel in Chapter 43 and beyond. This is the good news following all the terrible prophecies that Ezekiel had to bring against the nations, and the prophecies of returning Israel (Dry Bones - Ch 36 and 37) It is not obvious of which Temple this speaks and when it will be built; is this the Third Temple? Two books are particularly helpful and provide useful reference material to help understand what went on in the Temple. This book seeks to examine the details of all the components of the Tabernacle and to draw the pictures of Messiah contained in them. In order to achieve this he explains the symbolism of numbers, materials and colours in Jewish tradition. This comprehensive book examines, apparently, everything that is known about past Temples and prophecy about future Temple(s). In addition to studying the Temples from Solomon's time until 70 AD (CE) he looks back beyond the Tabernacle to the Garden of Eden. From there he looks forwards to Revelation and reveals a remarkable, continuing pattern. The parallel existence of the earthly and heavenly Temples is also discussed. The history of the Temple area and the ongoing political / religious arguments centred around Temple Mount are studied with inputs from parties on all sides. Many further reference sources are listed in this book, including models of the Temples and a "virtual Temple" on a CD ROM. Why would we believe that the Temple will be rebuilt? Jesus' discourse on the Mount of Olives, and Paul's letter to the Thessalonians suggest that the Temple will be rebuilt and standing at the time just before Jesus return. The antichrist will set up the "abomination" in the Temple. 3As Jesus was sitting on the Mount of Olives, the disciples came to him privately. "Tell us, " they said, "when will this happen, and what will be the sign of your coming and of the end of the age?" ........................ 15"So when you see standing in the holy place `the abomination that causes desolation,' spoken of through the prophet Daniel--let the reader understand-- 16then let those who are in Judea flee to the mountains. .................If those days had not been cut short, no one would survive, but for the sake of the elect those days will be shortened. It might be wise to handle this topic with caution. (Solomon's Temple is the known as the First Temple, and the term "Second Temple", refers to the one built in the time of Zerubabel which was subsequently rebuilt by Herod, and destroyed in 70AD (CE). Studying the Tabernacle and Temple appears to be essential if we hope to understand current events in the light of God's unfolding plan. The Temple Institute - a non-profit educational and religious organization located in the Jewish quarter of Jerusalem’s Old City - has launched a global campaign for the rebuilding of the Temple. This is how to bring true peace to all mankind, says Rabbi Chaim Richman, the Institute’s international director. "First and foremost, there is the mitzvah (commandment) of building the Temple for the entire nation," Rabbi Richman told United with Israel during an interview at his Jerusalem office. "The function of the Temple Institute is to awaken the hearts and to serve as a think tank as much as we can on a scholarly level." The Institute has been preparing essential vessels for many years, but there are other areas of focus as well, he said. "Just like any building project of such a scope, you need proper plans. For the Holy Temple, that’s very expensive." What is even more important than the money, he said, is providing an opportunity to people to participate in the building of the Temple according to each person’s ability. "We have actually completed the blueprint for one area of the Temple – the Chamber of Hewn Stone, which is the chamber of the Sanhedrin (rabbinical court)." "The simplest connection," he said, is that the IDF is going all the way into Gaza to capture the "terrorists wanting to kill us, but the Temple Mount is under Hamas. They are flying flags over the Temple Mount…. Mobs of tens of thousands of Arabs rioted there a few days ago." Although the site is officially under the administration of the Jordanian Waqf (Islamic Trust), people who attack Jews on the Mount receive monthly salaries from Hamas, Rabbi Richman asserted. "This is no metaphor. On the simplest level: We are going into Gaza, but they’re in our backyard. And it’s God’s front yard." "On a deeper level, he continued, "we are fighting a war of existential survival," pointing to the IDF’s discovery, during the current war, of Hamas’s plan for thousands of terrorists to invade Israel through dozens of tunnels on the coming Jewish New Year – a plan that was thwarted by the Israeli military. "But there is a difference between surviving and flourishing," Rabbi Richman said. "Flourishing means bringing back God’s presence" and making the Holy Temple a place of prayer for all nations, according to the prophecy of Isaiah. "We are surrounded by hostile Arabs. Are we going to be in it forever, or are we going to bring about the Redemption for all mankind?" According to Rabbi Richman, the fact that "we’re in this specifically now is so divinely orchestrated. I believe this is like a Tikun (rectification). God wants us to honor him and to be Jews. The fact that these monsters want to kill us is a chilul Hashem – a desecration of God’s name. We have to show that we are not like that. "So what is really going on right now? The whole world is speaking vilely about the nation of Israel. This is our Tikun – the Tikun of moving and building, of doing something about it." Equal Rights for All Humanity, Not Only Jews. Not only Jews, but all non-Moslems are denied equal rights at the Temple Mount, according to the status quo, Rabbi Richman said. "The Temple Mount is not about civil rights for the Jewish people. It is about equal rights for all humanity to pray at the holiest place," he declared, noting that in the days of King Solomon, the kings and queens of all nations were free to worship there. "But a Jew can’t even move his lips in prayer now," he said, acknowledging that fighting for equal rights is "an important first step." "But what we’re talking about here is a spiritual revolution, and in that the Temple plays a very key role. I think this subject is becoming more mainstream than ever before." Several Members of Knesset (Israeli Parliament) have been advocating for Jewish prayer on the Temple Mount, he pointed out. The very fact that a dozen or so lawmakers have been so outspoken about this issue, in Rabbi Richman’s view, testifies to the accomplishments of the Temple Institute over the past 25 years. "Years ago, you would not be able to talk about it," he said. "You would be laughed at. You would never make it to the Knesset. "This is a very blessed development. It shows a paradigm shift in the consciousness of the nation." Have you ever read the book of Leviticus and wondered why God gave so many instructions about killing animals, applying blood and burning flesh? Have you wondered what relevance all this death has for us in the new covenant? Obviously it is concerned with reconciling sinful man with a holy God, but sacrifice is still a difficult and little covered subject. Tommy Tenney throws some valuable light on the matter in chapter 3 of The God Chasers, entitled, "Dead men see His Face". In this chapter he discusses the importance of death. Moses wanted to see God’s glory, but God had to tell him that it would kill him. While we are alive in our flesh God dare not come too close or His glory will destroy us. "Only dead men can see God. There is a connection between His Glory and our death.". The thrust of God Chasers is that there is a way to God’s face, but it involves our death. The substituted animal was not just taking the punishment due to us, it was providing the death and the destruction of fallen flesh that man needs if he wants to draw closer to a holy God. This explains how what we would find an unpleasant odour of burning flesh could be "an offering made by fire, a fragrant aroma for Adonai." (Leviticus 1 v13 and others) The more our flesh is burned up, the closer we can come to God's face. In New Covenant terms we are talking true and deep repentance of the corrupt ways of the flesh. In Romans 8 v13 Paul said, "For if you live according to the sinful nature, you will die; but if by the Spirit you put to death the misdeeds of the body, you will live." And Peter said in 1Peter 2 v24, "He himself bore our sins in his body on the tree, so that we might die to sins and live for righteousness." ; Does this add something to your understanding of Jesus words in Matthew 1 v38-39? "and anyone who does not take his cross and follow me is not worthy of me. Whoever finds his life will lose it, and whoever loses his life for my sake will find it." Jesus not only provided life for us but death for our old selves: Romans 6 v3, "Or don't you know that all of us who were baptized into Christ Jesus were baptized into his death?". We may share in his death which we celebrate in the Lord's Supper. In this light we can see that the procedure for Yom Kippur make a lot of sense. (see The Day of Atonement) The blood which the High priest applied to himself before going through the veil was all about death, going in as a dead man and not taking sinful life into the presence of the glory of God. It is also interesting to ponder on the fact that the priests were ministering in Herod's Temple, in front of a veil that had no Ark and no Shekienah behind it, whilst the one in whom the Shekienah dwelt was riding down from the Mount of Olives on an asses colt. Could a similar situation prevail in our churches? 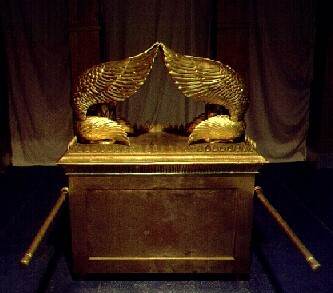 Where is the Ark of the Covenant ? There are theories that place it in various locations in Jerusalem and elsewhere in the world, but does it still exist and if so where is it and will it be found? Randall Price has explored all the available evidence and arguments and weighed them with Bible records. 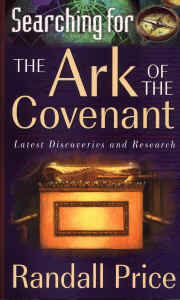 The unfolding investigation makes a gripping detective story, while explaining many things about the Ark and its purpose. "And," says ADONAI, "in those days, when your numbers have increased in the land, people will no longer talk about the ark for the covenant of ADONAI— they won't think about it, they won't miss it, and they won't make another one. The Israel and Temple Mount Faithful group is pressing hard towards rebuilding the Temple and re-establishing Temple worship. Other Jews have different beliefs about rebuilding, and secular Jews fear disturbing the status quo and provoking political conflict. Opposition from the Muslims is strong, as is to be expected. While denying that Temple Mount is actually the site of the Temple they are carrying out building work which is destroying archaeological evidence of the Temple. Important finds are turning up where the contractors are dumping the spoil. The spoil is now mixed with other rubbish to make this work more difficult and unpleasant. A large stone saw was installed on site to cut up the ancient stones. These works have now caused a worrying bulge to appear in the southern wall. The agencies that should prevent such acts appear unwilling to risk confrontation. Ariel Sharon has been blamed for starting the October 2000 conflict by visiting Temple Mount, but this is hardly fair. The conflict had already started with the murder of two Israelis and Palestinian radio had been inciting violence for several days. Temple Mount belongs to Israel but the government handed control to the Wakf ( Muslim authorities). While Israel's constitution protects freedom of religion and access to holy sites, the Muslim authorities deny Jews access to their most holy place. Why did Yasser Arafat seek control of all Jewish and Christian holy sites in Jerusalem ? It could hardly have been to improve freedom of access or worship ! See also Psalm 11 v4. Psalm 27 v4, Psalm 29 v9 - - - - - David appears to be referring to the Temple in Heaven.